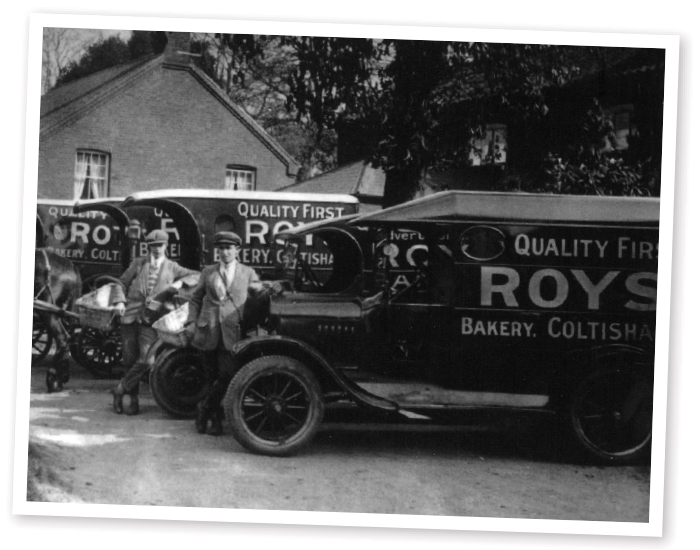 Roys was founded in 1895 when brothers Alfred and Arnold Roy opened their first general store in Coltishall, Norfolk. The store was successful and soon the brothers set their sights on other towns. They selected Dereham, and for their third site, a piece of land just outside Hoveton St. John. This new store which opened in 1899 was a mile down the road from the main village of Hoveton but Wroxham train station was nearby and virtually all Roys’ supplies came by train, addressed to “Roy Brothers, LNER Station, Wroxham” and telegrams followed suit with a similar address. This was the beginning of the Roys of Wroxham name. The Wroxham store became a thriving business, attracting many customers who stopped off en route to Cromer (a then popular and fashionable beach resort) to hire skippered sailing wherries. Boat makers and other traders in the area quickly adapted and a new trend began, boating on the Norfolk Broads. The Roy brothers were happy to meet the needs of the holiday makers and during the early years of the 1900’s the company consolidated a strong base. 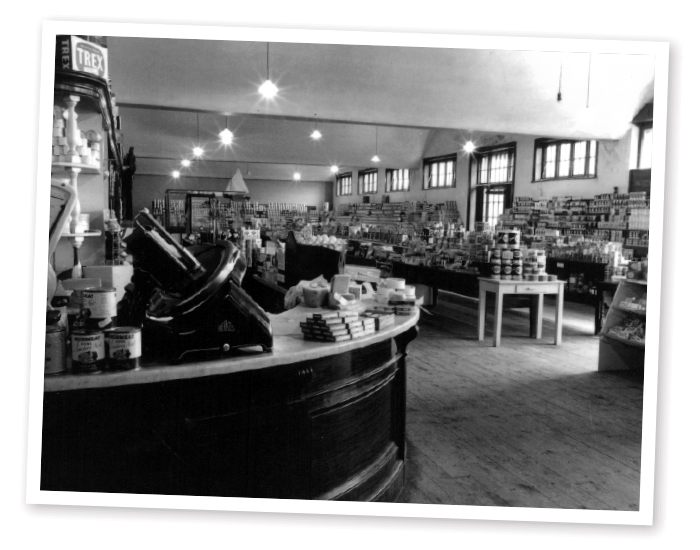 World War I broke out in 1914 and Walter Frostwick - manager of the Dereham store - was called up to fight. The store was closed and leased to International Stores allowing the brothers to focus their efforts on Wroxham and Coltishall. Arnold Roy was called up in 1916 and when discharged in 1921 his papers were signed by the then Secretary of State for War, Winston Churchill. The two of them shared the same birthday and from that point on they exchanged birthday greetings with each other. After the war, trade began to develop fast and the horse and cart delivery service covering the nearby villages was expanded with the purchase of a fleet of former Royal Mail Trojan delivery vans. These red vans set the corporate colours from then on, as all that was needed to adapt the vans was a change in the sign writing. 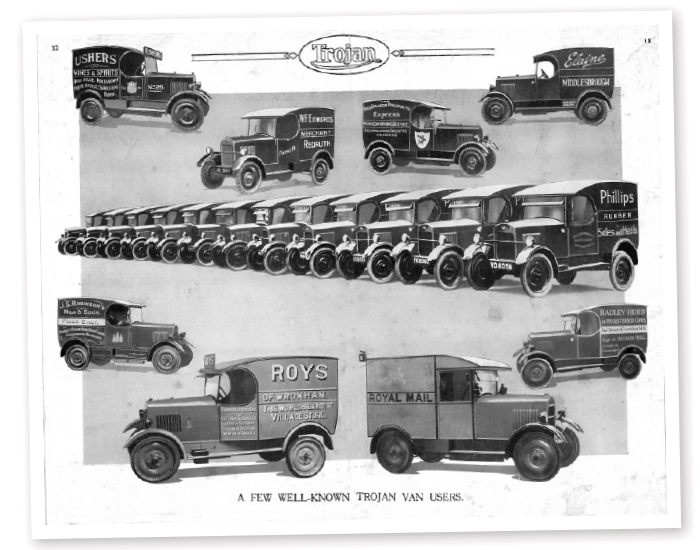 The van delivery service was so popular and successful that Roys’ vans appeared alongside other companies vans in Trojan advertisements as “A few well known Trojan Van users”. Further post-war developments were expansions in Coltishall and when a former employee Edmund Newstead returned from the war, having no vacancy at the time, the brothers bought the nearby Hunt’s Bakery on condition that Edmund would learn the trade and run the bakery. 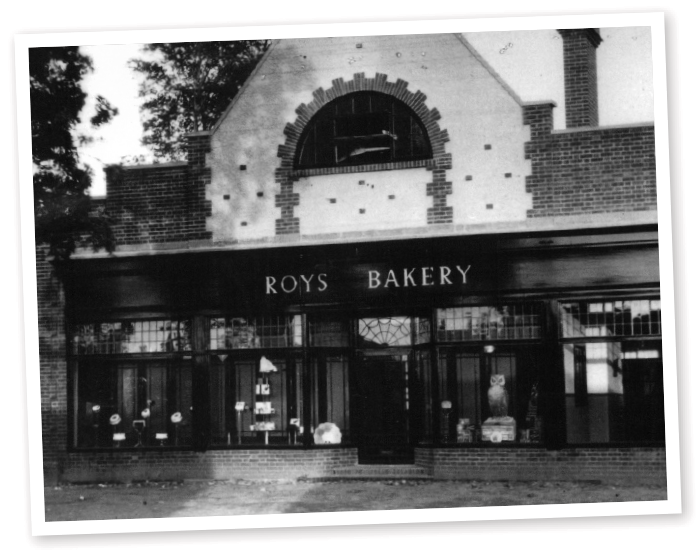 It proved a great success and in its heyday the bakery employed 50 staff, supplied the Roys stores and a large daily delivery round for customers encompassing 4 horse drawn carts and 2 Ford motor vans. The bakery was held in such high regard that other bakers travelled from near and far to admire and learn from the business. Over the next few years the company flourished, particularly in Wroxham where the company had expanded into tailoring, boots & shoes, drapery & millinery, pharmacy, ironmongery, furniture, carpets and a motor garage. Roys even provided the street lighting and public lavatories. In 1931 the headquarters of the company was moved to Wroxham and the company Roys (Wroxham) Ltd was formed. 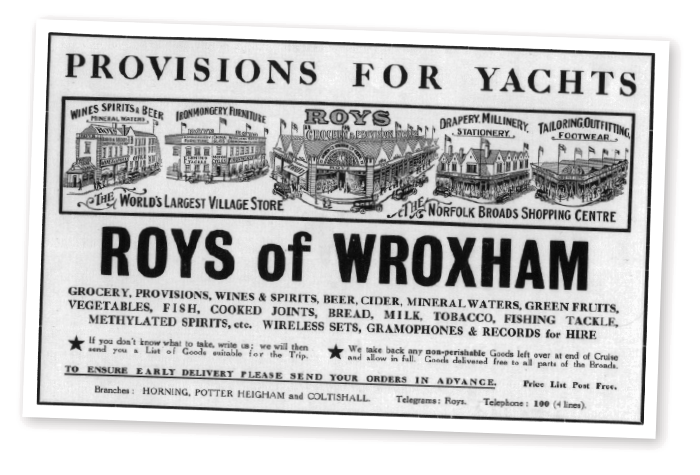 Early in the 1930’s Wroxham earned the title of “Capital of the Broads” and helped Roys to win an accolade in a widely publicised competition as “The World’s Largest Village Store” – a title that even to this day has never been seriously challenged. World War II brought change to the business, many of the previously male dominated jobs went to women and many of these continued their employment after the war ended. Fred Roy - Alfred’s son - returned from war in 1946 and joined the company working in the Coltishall branch. 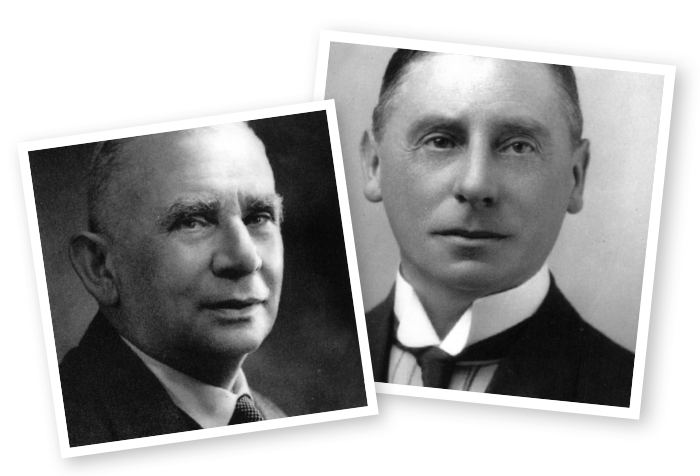 Following the deaths of Arnold and Alfred Roy in the early 1950’s, the business passed to Alfred’s children, Fred, Peter, Paul and Elizabeth. Fred Roy was appointed Chairman and Managing Director and, following fact finding trips to Australia, Canada and North America, introduced the concept of an ‘Out-of-Town Shopping Centre’ at Wroxham. 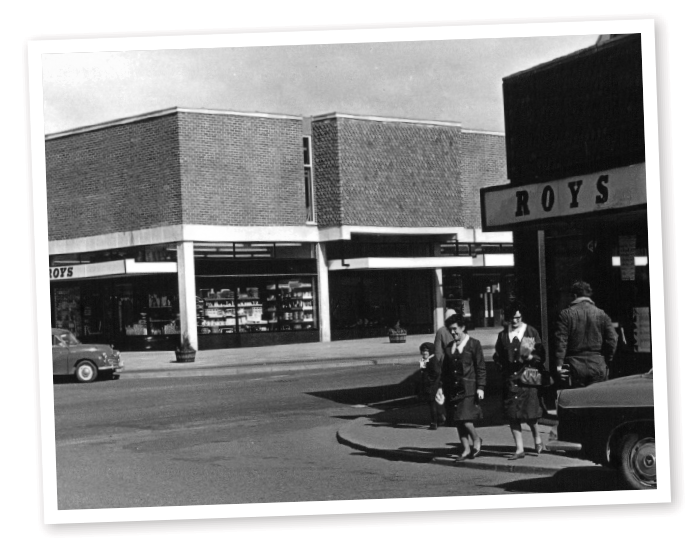 Roys Grocery was changed to a self-service system and parking offered for the expanding number of families owning motor cars. Plans were made for a large new store in Wroxham, involving changes to road layouts and public services. The new store, with 100 car parking spaces opened in July 1966. The larger, out of town, self-service supermarkets proved popular with the public who loved the greater choice of products and ease of getting all their shopping in one place. The need for grocery delivery rounds lessened and were finally stopped in 1968 and the combination of less people shopping in smaller specialist stores and new laws following the bakers’ strike of 1974 caused the Coltishall bakery to finally close in 1975. The discounting style adopted by all supermarkets of that time required bulk buying. The supermarket was expanded in 1973 & 1981 and a new food hall opened in the Eaton Centre just south of Norwich. In 1978 Roys became an early member of the grocery buying group NISA in order to further increase the ability to bulk buy and compete with national chains. 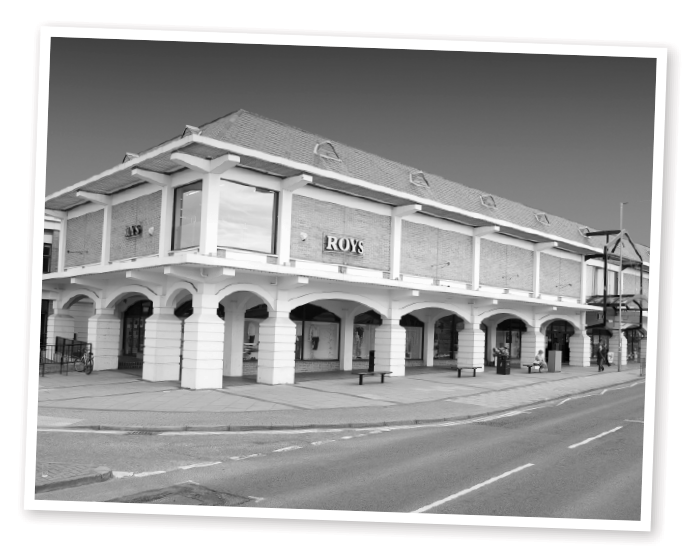 The 1990’s was a period of change for Roys, a number of new stores were opened; North Walsham (1992), Dereham & Sudbury in 1996, Thetford (1997) and Magdalen Street, Norwich in 2000. The Eaton Centre was closed in 1995 and replaced by a supermarket in Bowthorpe in 1999. A Major fire destroyed the Department Store in Wroxham in May 1995. A “Retail Warehouse” was opened in Church Road to lessen the impact of the fire and to continue trade in Wroxham while a new store was built. The new department store was completed in 1996, 40 years after its predecessor had opened. On Christmas Eve 1994 Chairman Fred Roy passed away at the age of 74. His brother Peter succeeded him and served as chairman of the board until his death in January 2004 at the age of 78, but not before his two sons Edward and Paul, representing the third generation of the family, had joined the board of directors. Under the leadership of Edward and Paul, Roys has continued to flourish and diversify buying the Broadland Motor Company petrol filling station in Wroxham (2011), opening a new store in Beccles (2012), acquiring Highway Garden & Leisure in Framingham Pigot (2013) and upgrading www.roys.co.uk to a transactional website in 2013. Roys to this day remains a family owned independent business and is looking forward to meeting the exciting new challenges of the 21st century.